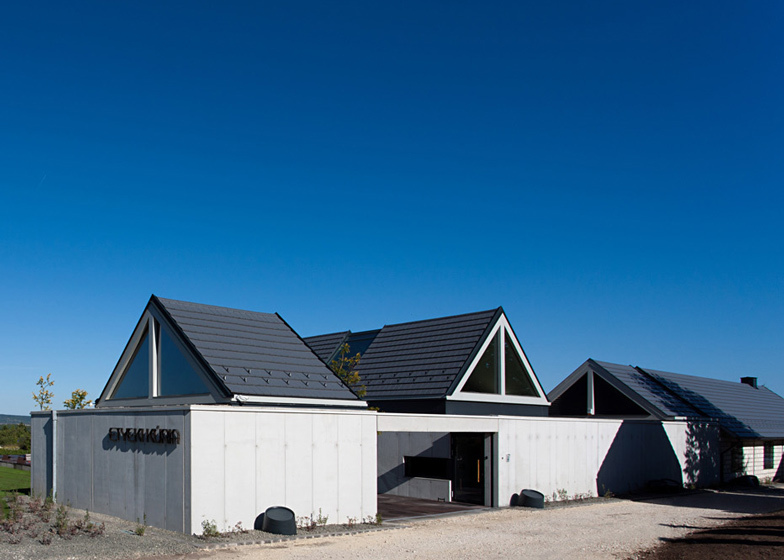 This cluster of gabled buildings by Hungarian office Bord Architectural Studio provides new tasting rooms for a winery in Hungary's Etyek-Buda region (+ slideshow). 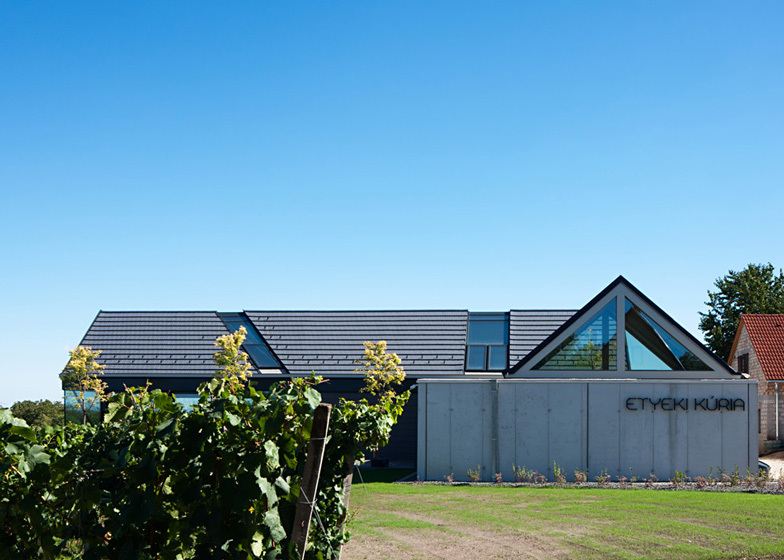 Bord Architectural Studio designed the complex for the Esterházy Etyeki Kúria Winery, which is located around 18 miles west of Budapest. 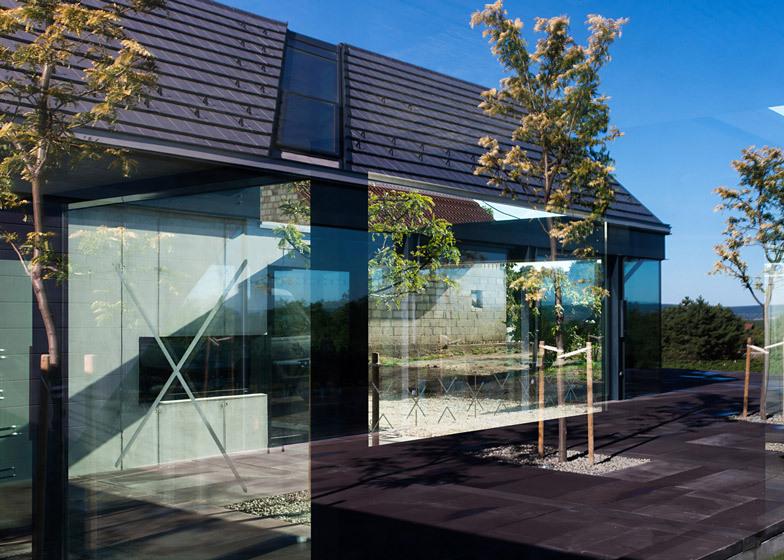 The owners wanted to modernise their existing wine cellar and pressing house, as well as adding new reception areas for visitors. Constructed directly above the old cellars, the new two-storey buildings fold around the existing pressing house and were designed with similar massing and proportions. "Our guiding design principles included suiting the scale to the surrounding small traditional pressing houses," architect Ildiko Pem told Dezeen. 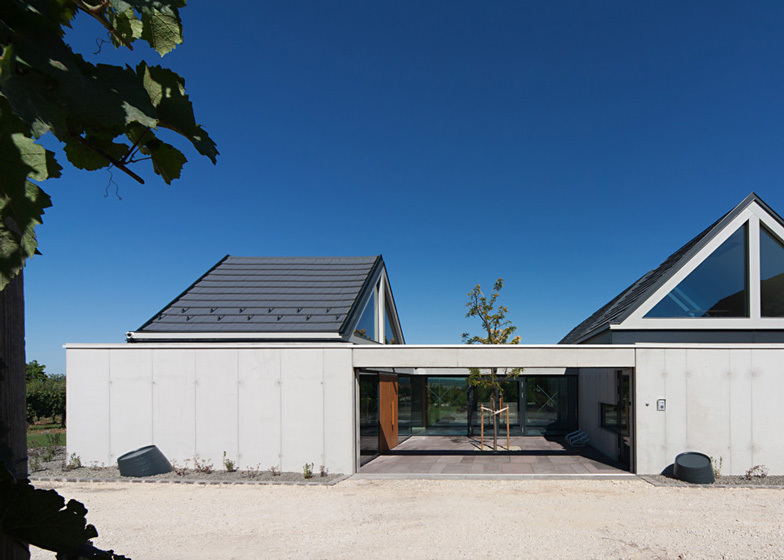 The buildings features concrete walls and tiled rooftops, interspersed with large expanses of glazing and angled skylights. 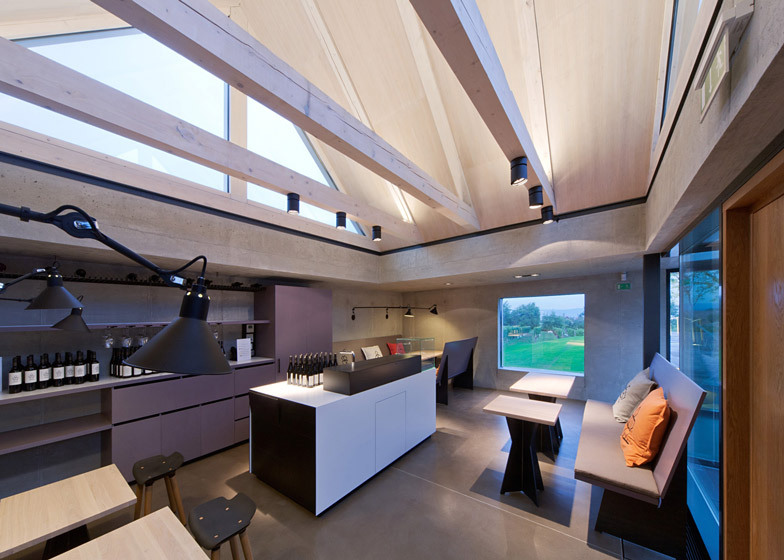 "[We wanted to] apply natural materials and let sunshine into the depths of the winery," added Pem. 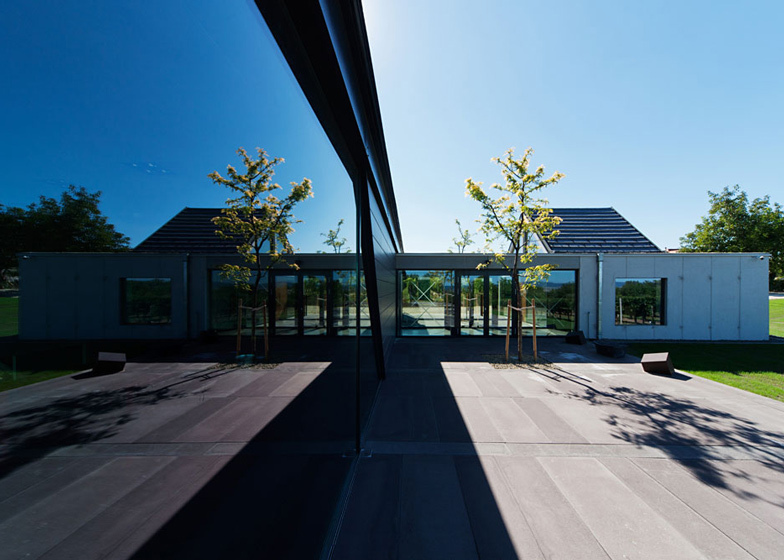 A line of trees marks the entrance to the complex, beyond which a small courtyard leads visitors through to a wine shop, an exhibition area and a new wine-tasting room. 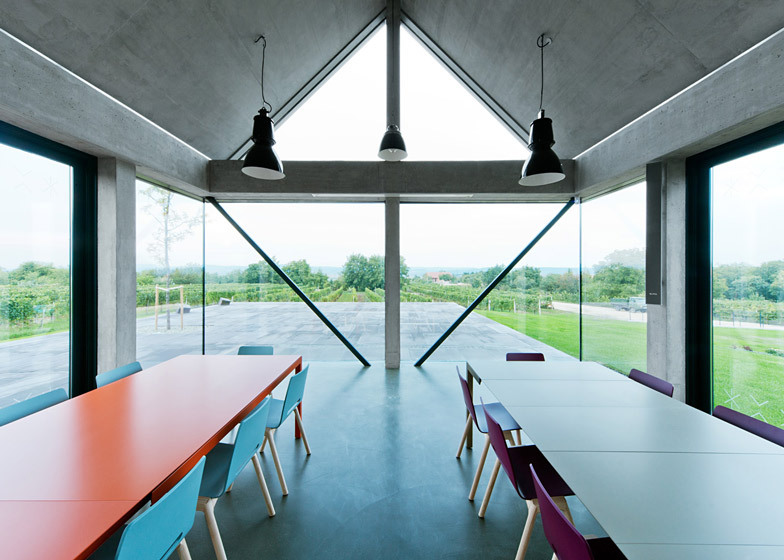 Floor-to-ceiling glazing allows views out across a new garden, as well as to the vineyards beyond. 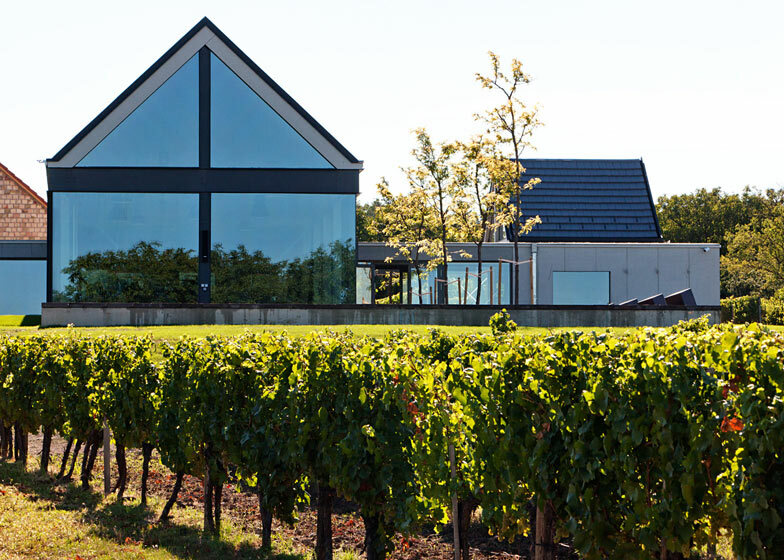 By this year's wine harvest the new building complex of the Hungarian Esterházy Etyeki Kúria Winery has opened its doors to the public. 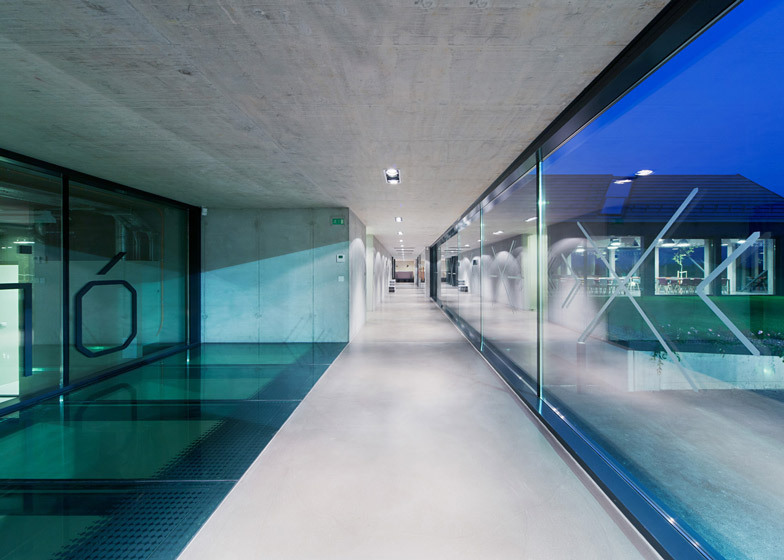 The new edifice with its spacious, state of the art plant and attractive wine tasting areas provides worthy space for the acknowledged winery due to the fresh design of the young Hungarian team, BORD Architectural Studio. Esterházy Etyeki Kuria Winery is one of the leading wineries in the famous Hungarian wine region of Etyek. 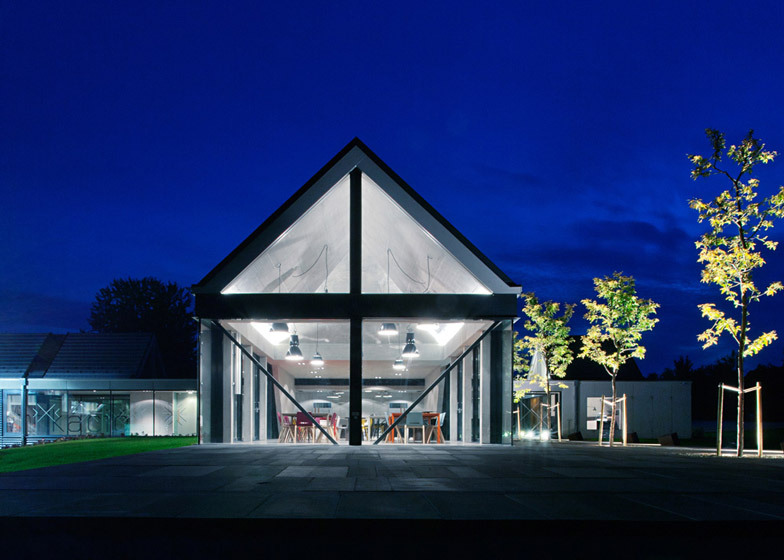 As a part of a complex development the owners of the winery commissioned BORD Architectural Studio to design a new, modern factory and visitors' centre, which blends well with the special atmosphere of the region and has an iconic appearance. The site is situated on the picturesque slope of Öreghegy, which is characterised by little, pretty pressing houses between the rows of grapes. Therefore the main concept of the design was to adjust the new building complex both to the unique manmade world and the amazing nature. 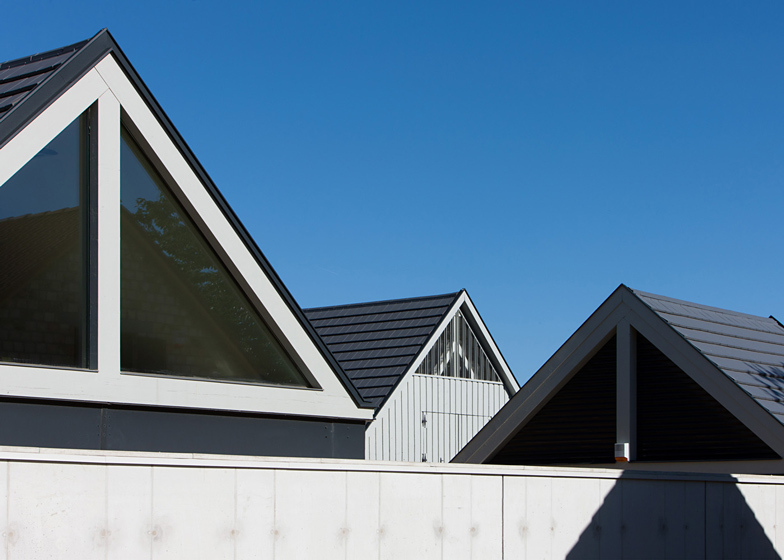 The volume of the new complex integrating the existing cellar and pressing house reflects the characteristic scale of the surrounding buildings in a new interpretation. 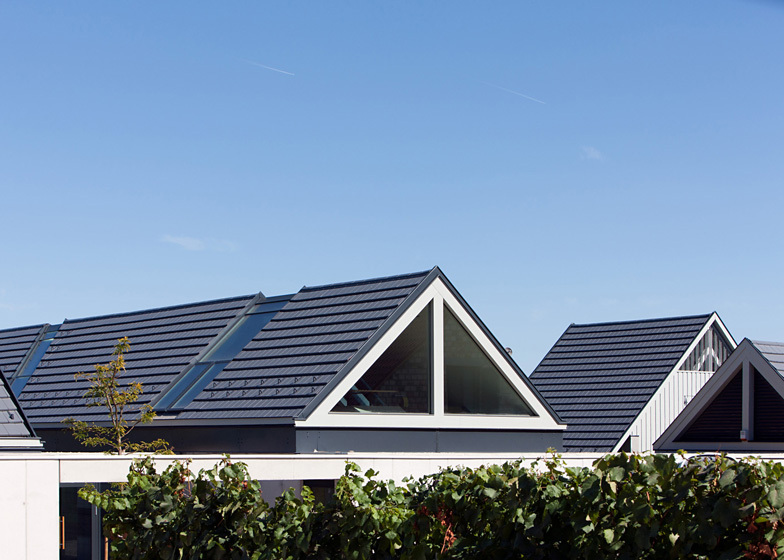 The new mass of the winery with the gable roofs on it, standing in line next to each other playfully, provides a contemporary character to the house. The gate of the new building complex is marked by an emphatic line of trees crossing the access way of the hill. Parallel with the trees a little protected entrance bay welcomes the visitors in front of the building. 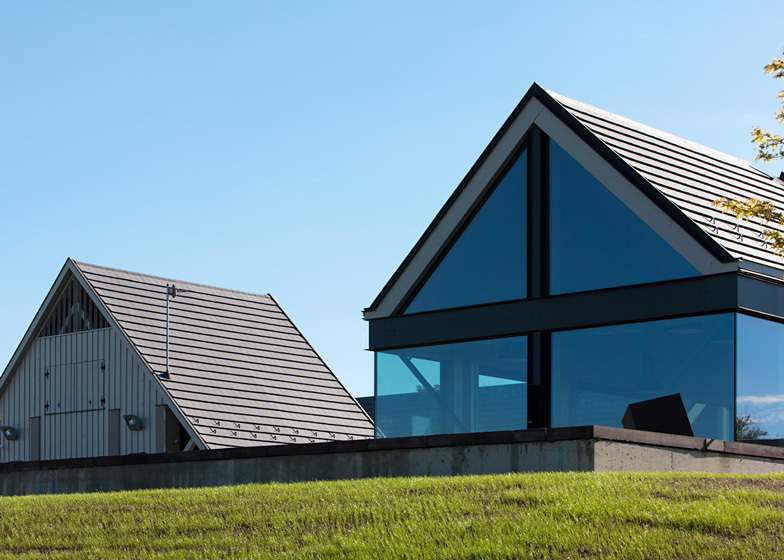 The vestibule of the visitors' centre, the wine shop and the open and sunny hall of wine tasting merge with the view deck and the vineyard which embraces the building contour. The landscape is always present. The energetic external appearance is perceptible from inside as well. The rhythmical sequence of airy and narrow spaces with different heights and proportion provides an exciting experience for the visitors. 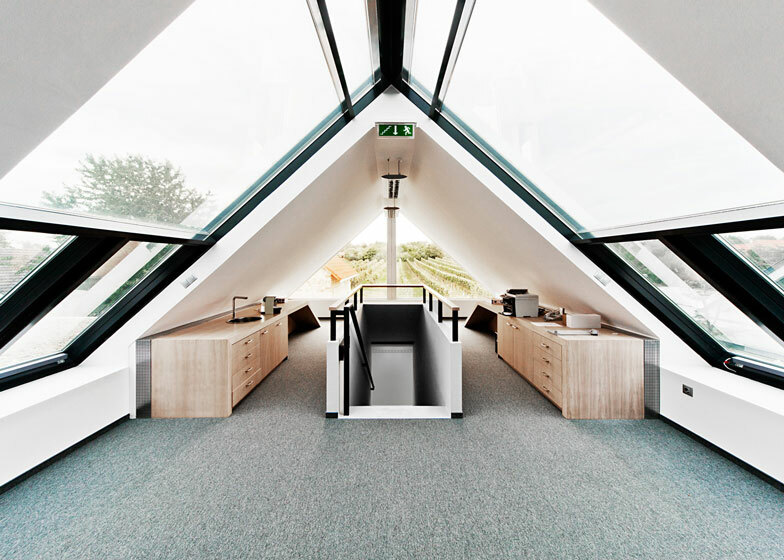 Due to the carefully arranged huge glass surfaces, the long slot lights, the open tympanums and the relationship between the different areas, sunshine permeates the whole building. Spaces for the public open views to the production process of the grapes, to the bottling house and to the depth of the cellar alike. As a result of playing with the light, the warmth of the sun that is essential to life is perceptible in the heart of the winery and in the fermentation areas as well. The building is exemplary not only in using quality materials, in the design of details but it is also environmentally responsible since its heating and cooling are solved by renewable energy resources. Preserving the deep cultural and social roots of the place and considering the high functional demands, the new centre of Esterházy Etyeki Kúria Winery still has an attractive, fresh appearance and hereby truly reflects the profession of the acknowledged winery.